The legacy of the Marshall Train Depot of Marshall, Texas and the proud beginnings of America’s Texas & Pacific Railroad are lovingly remembered in Casad’s distinctive historical picture book for children. 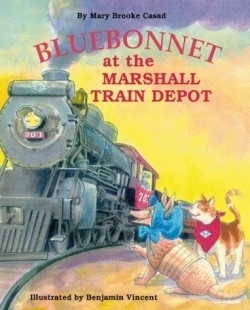 Bluebonnet at the Marshall Train Depot recaptures Marshall’s industrial heritage through the anthropomorphized narrations of the main characters, Bluebonnet, the Texas traveling armadillo, and “T.P.”, the Depot’s unofficial feline rodent exterminator and local historian. The story unfolds when Bluebonnet’s love for Texas history and adventure leads her to the famed town of Marshall. Marshall’s annual Lights and Fire Ant Festivals are long standing favorites for Bluebonnet (fire ants are a “spicy” delicacy for armadillos); however, it was the rich history of the Train Depot which claimed her visit to Marshall. The Depot was a large brick structure nestled between two sets of railroad tracks and was completely surrounded by a high wire fence; and just as Bluebonnet wondered how she was going to reach the Depot a voice from behind calls out, “follow me.” The voice belonged to “T.P.,” the Depot’s feline resident named after the Texas & Pacific Railroad Company that made Marshall famous. “T.P.” proudly exclaims that if Bluebonnet was interested in visiting the Depot, then he was the one who could show her around; and in order to reach the Depot, they must first “walk through (the) underground tunnel that was built in 1940 to (enable) safe passage under the tracks to the Depot.” Exhilarated and excited, Bluebonnet follows as “T.P.” expertly embarks upon a guided tour that magically brings the yesteryears of the Marshall Depot to life. Casad fills every page of her pictorial tribute with factual and detailed information about Marshall, Texas and the Marshall Train Depot; and the illustrations of Vincent chronicles Bluebonnet’s and “T.P.’s” historical tour with vivid colors and artistic detail.